First- Trevor Hoffman officially became a Brewer. Sorry Kaybee. Second- Justin Duchscherer avoided arbitration by signing a one year deal that could be worth $4.05 million dollars. Third- Sean Casey is retiring. The “mayor” will join MLB Network. His role is still unknown. Edinson Volquez is 25 years old. Volquez has a carer record of 20-17, an ERA of 4.37, and 261 strike outs. He also has a .97 fielding percentage. at pitcher. Volqez has played for the Texas Rangers and the Cincinnati Reds. With the Rangers Volquez made 17 starts and had a record of three and eleven. In his first season he went zero-four, with an ERA of 14.21, and only 11 strike outs, in six games, 12.2 innings. Following the 2007 season Volquez was traded from the Rangers to the Reds for Josh Hamilton, a deal that made both teams happy. 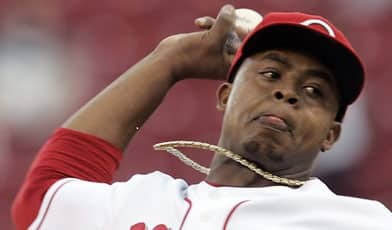 In 2008 Volquez had his break out year with a record of 17-6, an ERA of 3.21, and 206 strike outs. In the 2008 All-Star Game at Yankee Stadium Volquez didn’t do so well. He pitched one inning in which he gave up two hits and a home run. That one home run was to J.D. Drew, all-star game MVP. He did strike out two batters though. Volqez has yet to make the post season with the Reds or Rangers. Unlike Dustin Pedroia Volquez has the body of a major leaguer. He is six foot and weighs 200 pounds. In the 2009 Wold Baseball Classic he will play for team Dominican Republic possibly joining team mate Johnny Cueto, who went 9-14 with a 4.81 ERA, and 158 strike outs. remember when Tom Glavine got 300 win? People said he could be the last person ever to gat to 300. Volquez is on pace to get 300 wins if he plays another 15 seasons and not get injured. If Volquez does get to 300 he will be a sure lock to get into the hall of fame. 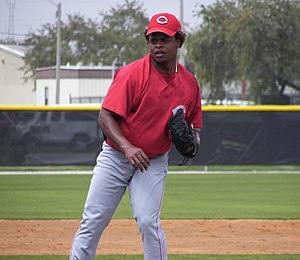 Edinson Volquez is only one of the promising Reds though, Jay Bruce, Joey Votto, etc. 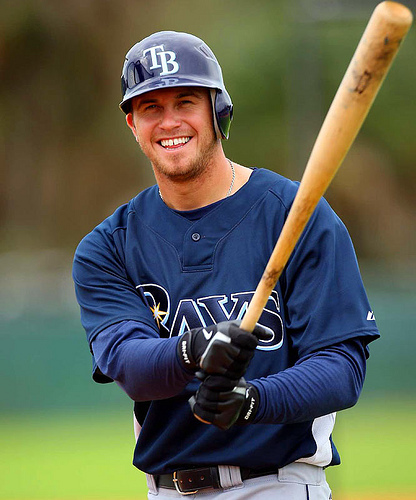 So Reds fans the Reds could be the Rays of 2008 his year. 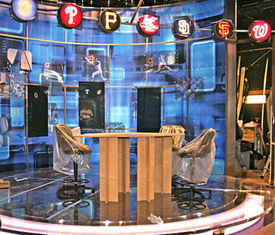 MLB Network . . . ROCKS! First- Manny could go to the Giants! They would have to show him a lot of money, but if they got him they would be the favorites to win the N.L. West. Second- The fix for the Dodgers is . . . B.) Sign Bobby Abreu, put him in right and move Andre Ethier to left. 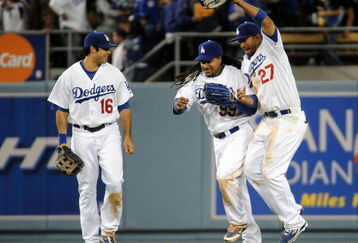 I think the Dodgers will do A.
Third- The Detroit Red Wings beat the Chicago Blackhawks, six to four, at Wrigley Field. It was the first time a NHL game was played at a MLB stadium. The MLB Network was awesome. It started out with Bud Selig welcoming us to MLB Network and thanking us for watching. He really needs to smile some more. Like in this picture. Okay he still isn’t smiling that much, but it looks like he is trying. After that they showed us the studios. I liked studio 42 named after Jackie Robinson. I liked all the people on the show but I really liked Matt Vasgersian, Barry Larkin, Al Leiter, and Harold Reynolds. They had Jimmy Rollins on the show and talked to Josh Hamilton while he was at home. They demonstrated Jackie Robinson’s steal of home where Yogi got all mad in the World Series. They also talked about Manny. They had some news headlines like Barry Bonds getting hip surgery in an effort to make a comeback. After Hot Stove Live, they had Don Larson’s perfect World Series game. They had Yogi and Larson guest in the studio. They showed the original broad cast with even the same commercials! They were really funny like the one with the baseball encyclopedia. I think a better choice for the first game should have been the last game of 2008 since it was new years or Roberto Clemente’s last game because New Years was the anniversary of his death. Here are some fun facts. First- The Boston celtics are on an 19 game winning streak! Setting a ton of records a long the way. Second- When you write your entries is any one else having problems going to the dash board page? Fifth- Where do you think Manny will sign. I think it will be with the Dodgers very cheap, maybe 2 years $35 million. Braun was rookie of the year in 2007 along with Peedie. He was an important part in getting the Brewers into the playoffs. He hits for power and brings in runs, along with being kind of fast. I’ve seen Braun play once, when I was visiting family in Milwaukee, and well he is good. he was 4 for 4 with a homer, a double and two singles. I still think he should have won N.L. MVP. Sizemore is one of the best players in the game. He has great defense along with a great bat and speed. He won a Silver Slugger and a Golden Glove for outfielders this year. Sizemore was another example of a great player playing for a bad team. Sizemore will also play for team U.S.A. in the World Baseball Classic. With flames running down his arms walking up to the batters box in Yankee Stadium, you just knew something was going to happen. I know he is plays center but he can play right great. I don’t think there was a better fell good story in baseball other then maybe Lester or Baldelli. Recovering from drugs and being an all-star. He wore out down the stretch though but he had never played that many games in his life. Today I’m going to go threw the top 5 moments of 2008, post season or regular season, in know order. Josh Hamilton is know a hero to some kids. He goes to schools and talks about drug education. Hamilton had a dream in it he was hitting home runs at Yankee Stadium, when asked how many, he said I don’t know, I lost count. 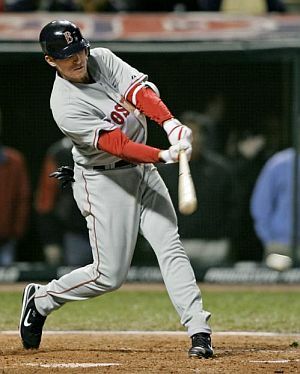 He crushed the old record of 24 home runs in the first round. He even had his 86 ( I think ) year old coach pitch to him. He even hit the adds in right-center field. He didn’t have to bat the second round to go on. He just ran out of gas though, in the derby and the end of the season. I hate A-Rod but isn’t it weird that the future home run king ( it kills me to say that ) hit it at Cinderella’s castle, if you know what I mean. I would have liked instant replay to have began in 2009 because what if you lost a game due to no instant replay then won a game due to instant replay. What I should say is a overpaid, over rated, juicing player hit a home run at a dump, where the couldn’t afford to have “devil” in front of their name (ha ha). Why didn’t he only play at his home stadium. If you want 600 home runs would you want to hit it in front of people who boo you, and in front of almost no fans? Junior is a legend though. He got to play with his dad how can you not enjoy that? Well, ok, some times you won’t. Still why not play at the Great American Ballpark? By the way, that name should be change. Any way Junior is a first ballot hall of famer. I hate this moment, but at the same time I can’t hate it. I went to my first baseball game here when I was a kid. I got booed being and picked on when I lived in New York city as a kid, being a Red Sox fan. Yankee stadium is amazing though, the Babe, Mickey Mantle, Ted William, George Brett and Nolan Ryan all played here as the favorites or the guys drunk fans yelled at. There were so many moments here don’t blow it up save it as a museum. Who wouldn’t want to hit a walk off homer to send your team to the playoffs. Being Braun the best hitter on the Brewers, wow. Braun is amazing after A-Rod becomes homer king, the Pujols, the look out for this kid. Braun also almost joined Peedie as being the forth player to win Rookie of the Year and MVP in back to back years. When Braun is done look for him to be a first balloter.